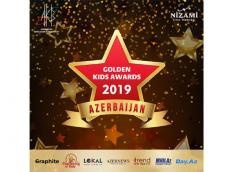 Golden Kids Awards 2019 will be held in Baku. The contest, honoring the International Children's Day will bring together children aged between 5 and 16. The event is organized by Azerbaijan Public Association of Volunteers, Trend Life reported. The main goal of the project is to disclose creativity and develop the abilities of the younger generation. The winners will be determined in the following categories: Best Artist, Best vocalist, Best pop singe, Best pop band, Best model, Best pianist, Best violinist, Best children's choir, Best dancer, Best Dance Ensemble, Best Actor, Best Leading, Best Chess Player, Best Athlete. Posters of participants will be distributed in social networks in April-May. The gala evening will be held on June 1 in Baku. To participate in the contest, send CV and video to goldenkidsazerbaijan2019@gmail.com.